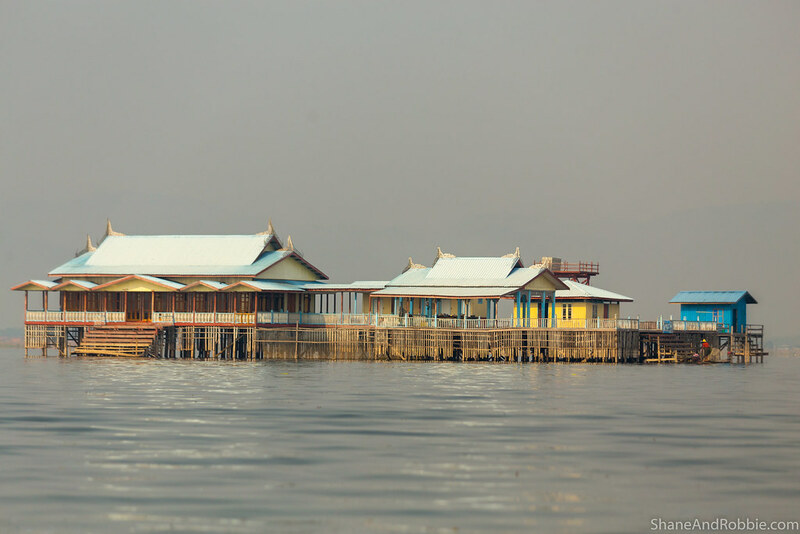 Alongside Bagan and Mandalay, Inle Lake is one of Myanmar’s top tourist destinations – attracting millions of visitors every year. Today we hired a boat and went to see for ourselves what all the fuss is about… Our verdict? 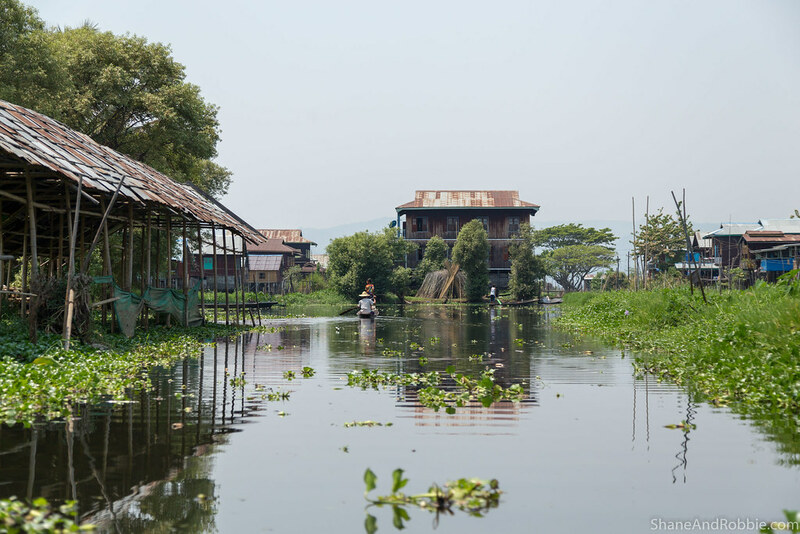 Yes, it’ touristy, but Inle lake is still absolutely worth visiting! 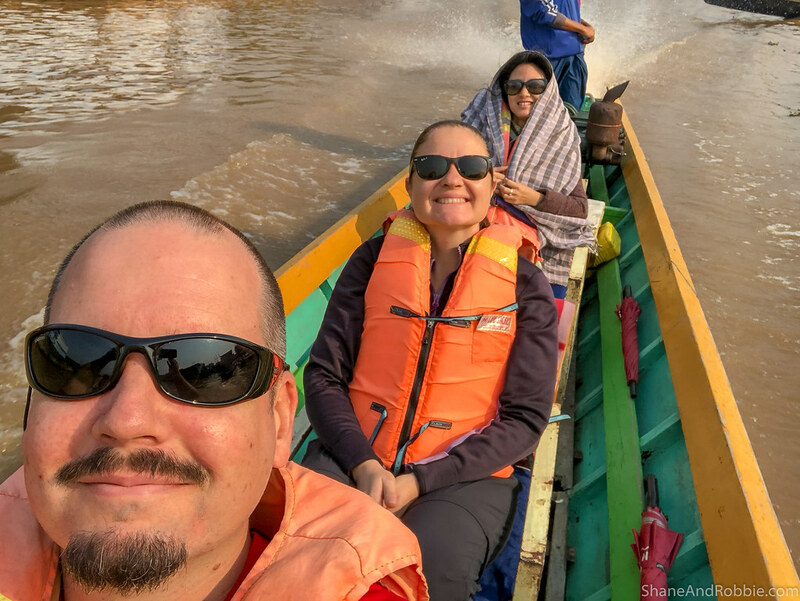 I recovered quickly from the mild dose of gastro I got in Bagan, so we were able to set off early this morning from the Nyaung Shwe boat pier. Along the way we passed homes along the river bank and watched people as they did their washing in the river, and started their day. A short ride down the river and we were on the lake, the shallow waters of this 116 square kilometre lagoon spread out around us. 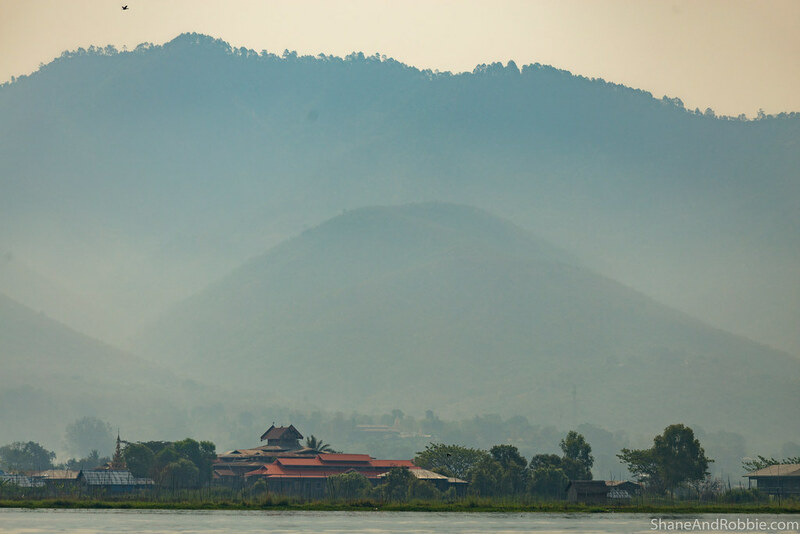 Inle Lake sits at about 900m elevation, so it’s quite cool up here compared to other parts of Myanmar we’ve been. As we started our journey across the lake, it was still pretty cold, but it was beautiful and quiet. 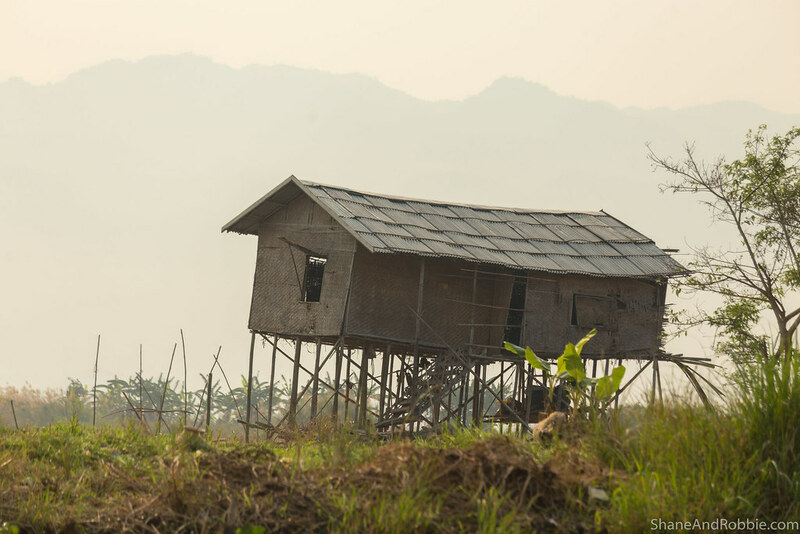 The early morning mist was just lifting and we could see the mountains of Eastern Myanmar in the distance. Not long into our journey we came across Intha* fishermen plying their trade on the lake, using the one-legged paddling technique and bamboo cages/nets they’re famed for. We saw the fishermen stand at the end of their little teak boats, wrap one leg around the oar and steer/paddle with their leg, leaving their hands free to fish. 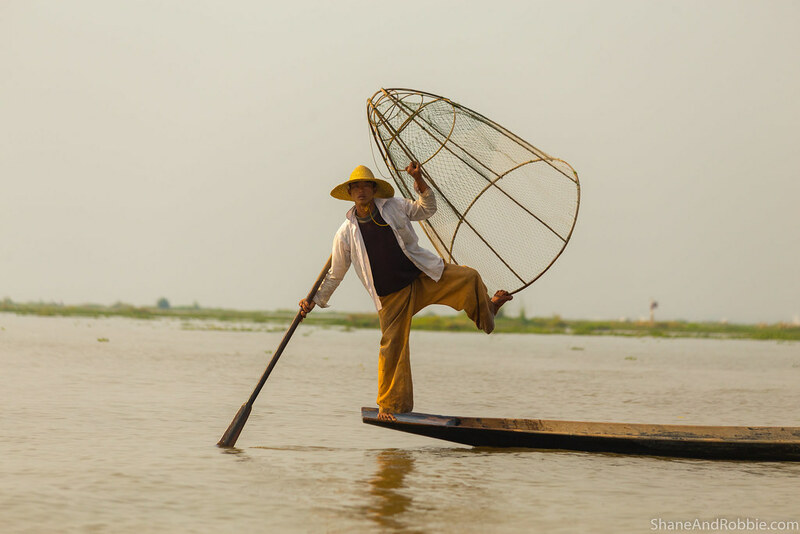 They weren’t fishing using nets, however; instead they cast conical bamboo cages and used these to trap fish. The fishermen then speared any trapped fish through the hole at the top. 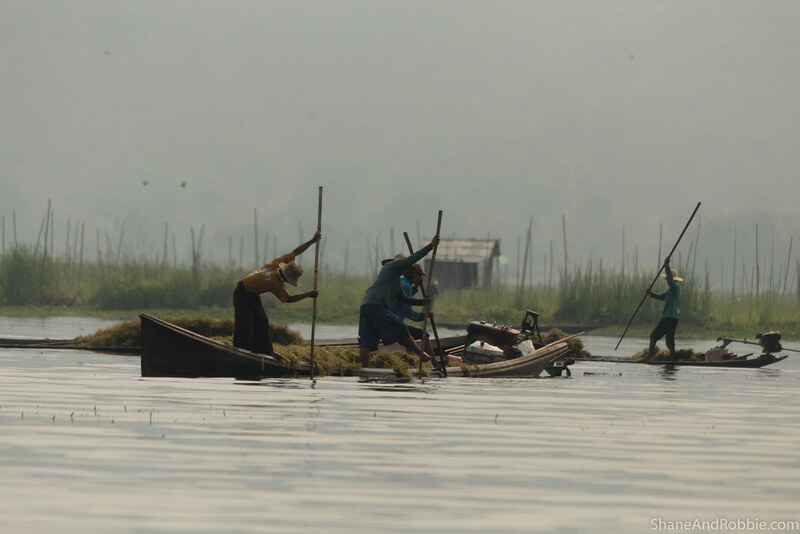 This fishing technique evolved because the lake is shallow** and full of water plants; this means fishermen can’t simply sit down and/or throw a net in to catch fish – they need to stand to be able to see the fish and they need their hands free to cast their bamboo cages and spear the fish. Fascinating to watch! 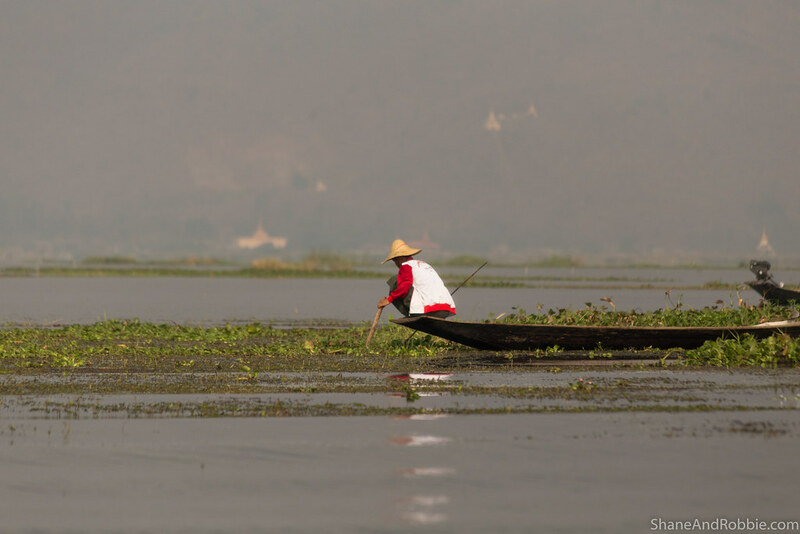 *The Intha are the tribe after whom Inle Lake is named. 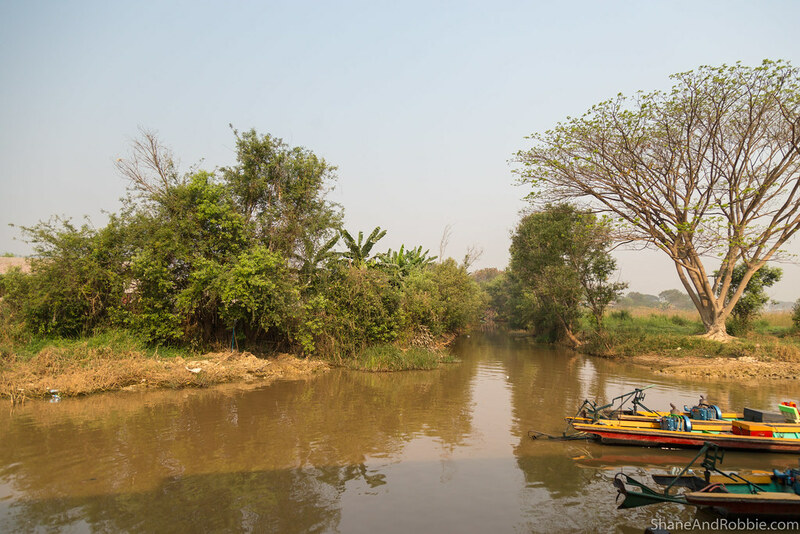 **During the dry season, the average water depth is only about 2m, with the deepest point being 4m. This increases by about 1.5m across the lake in the wet season, but overall the lake is still quite shallow. This allows water hyacinths and other water weeds to flourish. Many of the fishermen we saw were almost done for the day – our guide told us they usually start their day on the lake well before dawn to ensure they have fish ready to sell at the days’ markets. There were many people out harvesting water weeds, however. 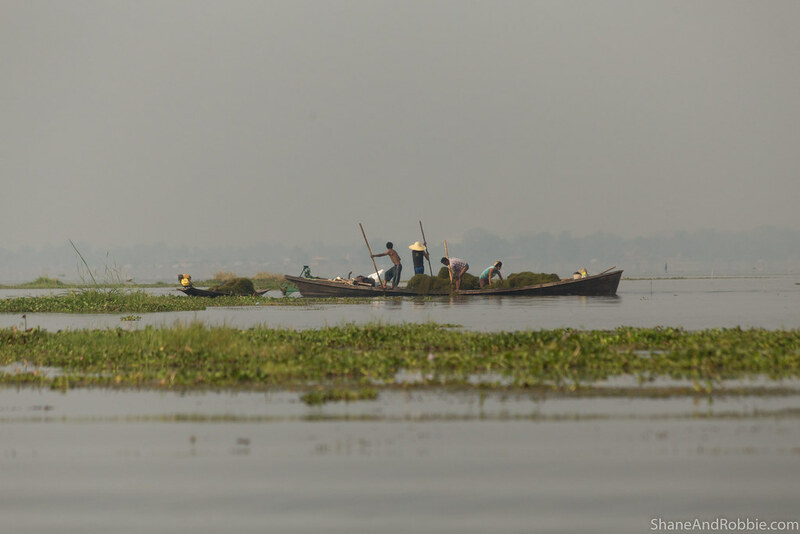 These are collected to build up the floating islands that the Intha use to grow vegetables. 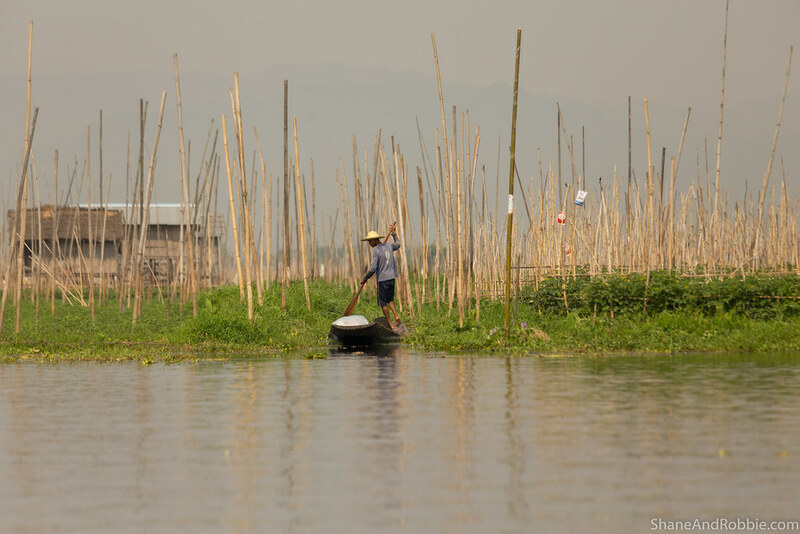 The floating gardens are built up of decomposing water weed supported on wooden trellises anchored to the bottom of the lake by bamboo poles. These gardens rise and fall with changes in the water level, and require a lot of manual labour to establish and maintain. The effort is worth it though as the nutrient-laden waters of the lake and the rotting water weeds produce incredibly fertile garden beds that yield bountiful groups of delicious vegetables. 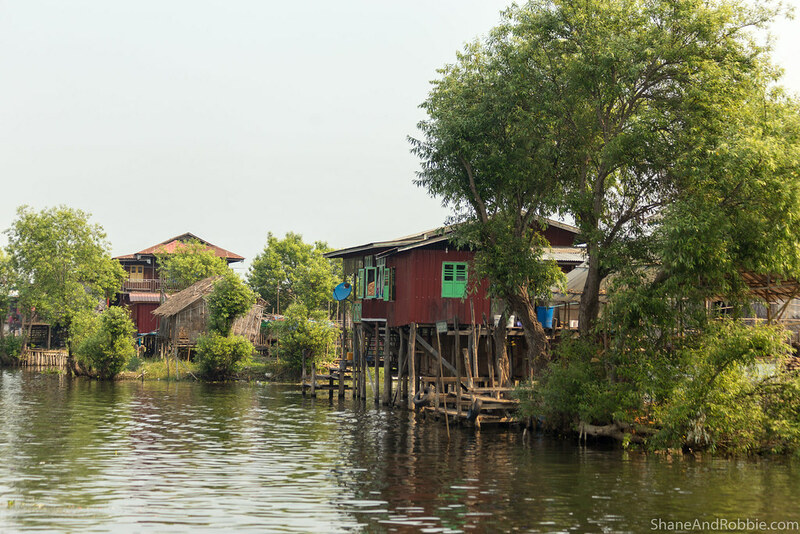 We passed through a number of villages during our boat trip, all of them built over the water on stilts. 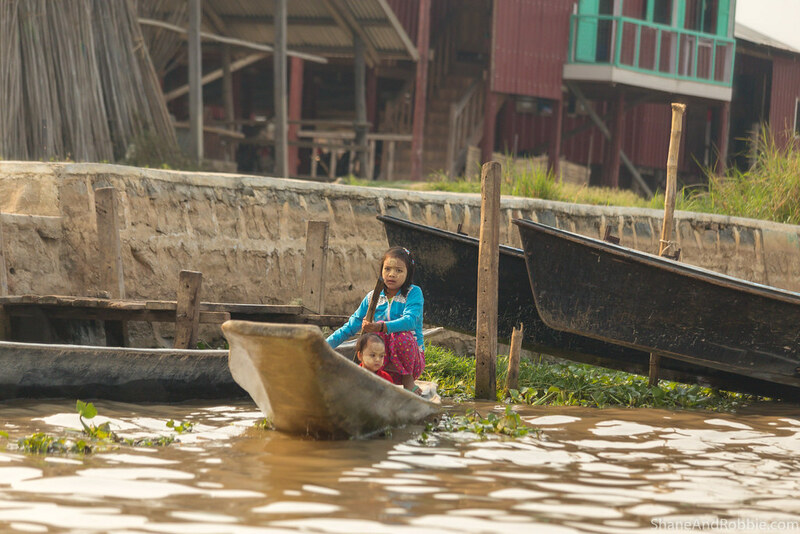 Small boats of all sizes navigated the waterways between the houses, creating a captivating scene. 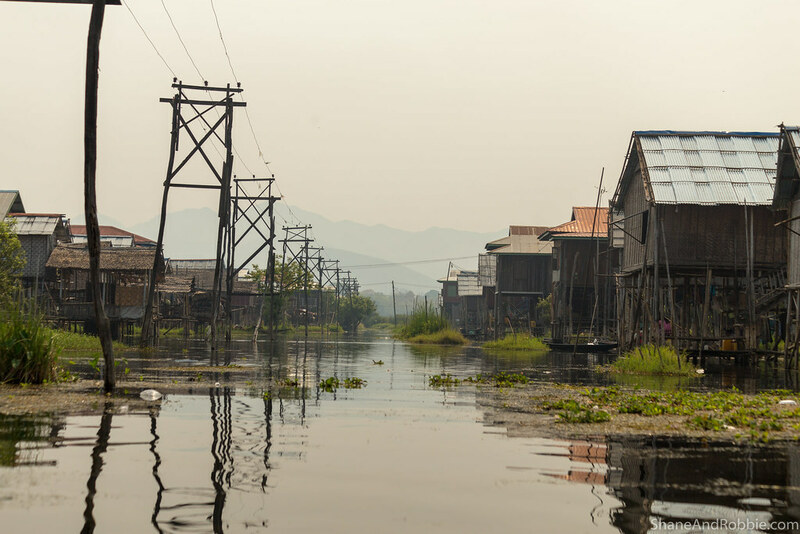 There are about 70,000 Intha living on Inle Lake, spread across dozens of small villages. 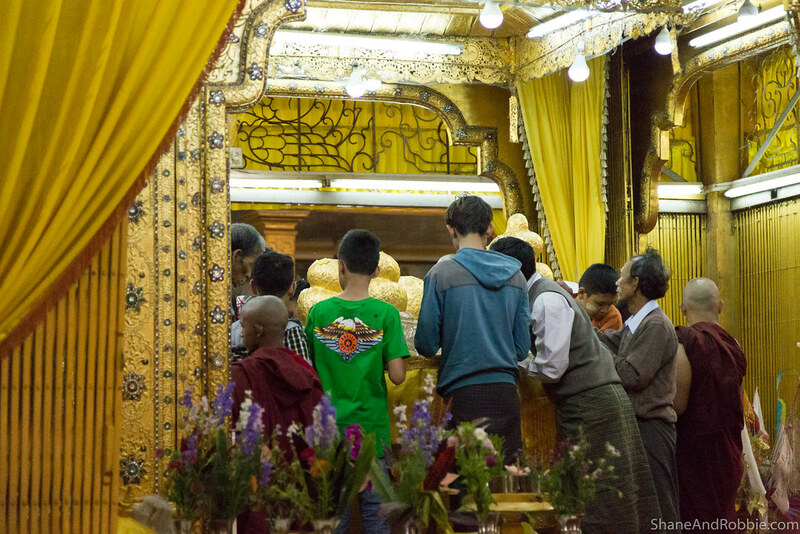 Most are devout Buddhists, and live largely as self-sufficient fishermen and farmers. 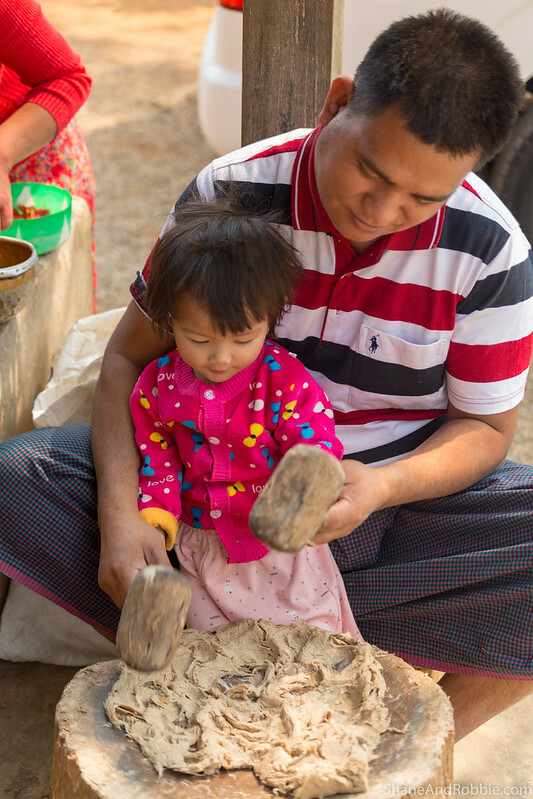 Extra household income comes from the making and selling of handcrafts too. There are many different types of workshops situated around the lake area run by cooperatives of artisans. 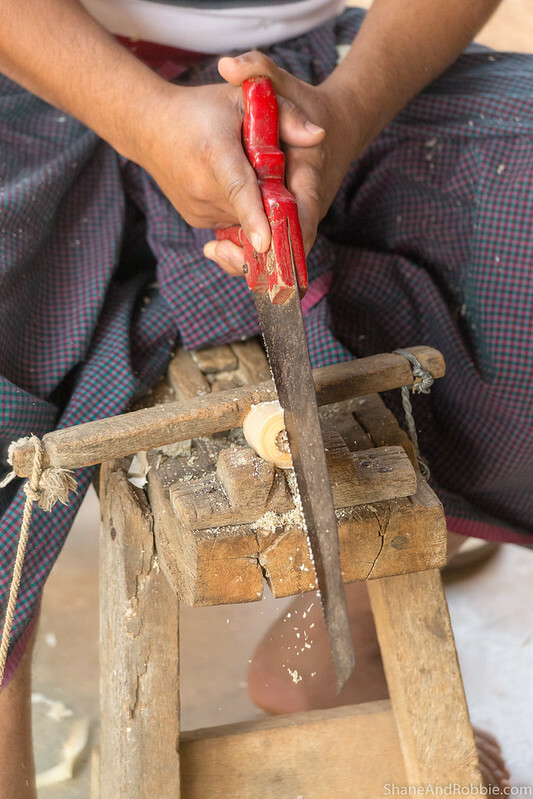 Like so much of Myanmar, household goods here are still hand-made by craftsmen using methods that are centuries old. Factory-made, mass produced goods are still very rare outside the big cities. 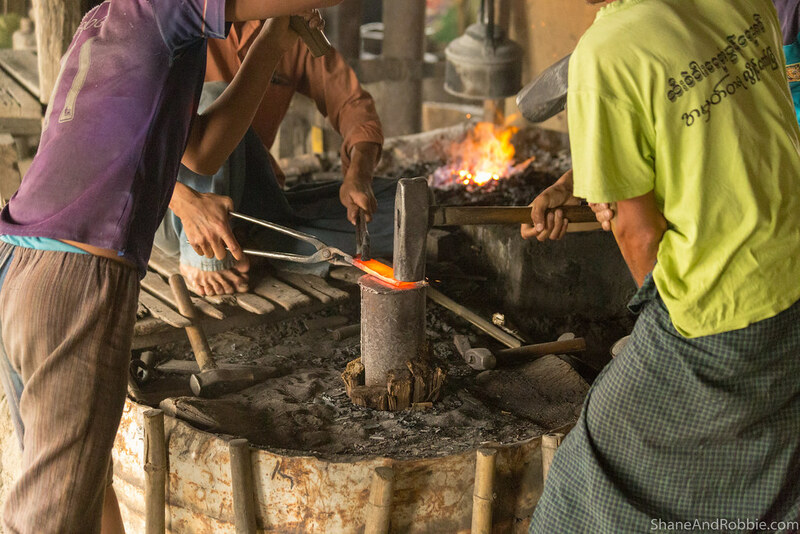 One of the most fascinating aspects of visiting Myanmar for us have, therefore, been seeing how things are made. It’s like a glimpse back in time, watching crafts-people create things of beauty and utility with a level of skill and care that has become almost obsolete in the modern, developed world. Our first “craft stop” was a boat building workshop, where we watched young men manually sawing teak logs into planks to then shape into boats. The whole process was incredibly labour intensive! As was the work we saw underway at the blacksmith. Here we watched a hand-pumped kiln used to heat a bar of metal, which was held in place by one man whilst 4 other men wielding large sledge hammers to shape the steel. 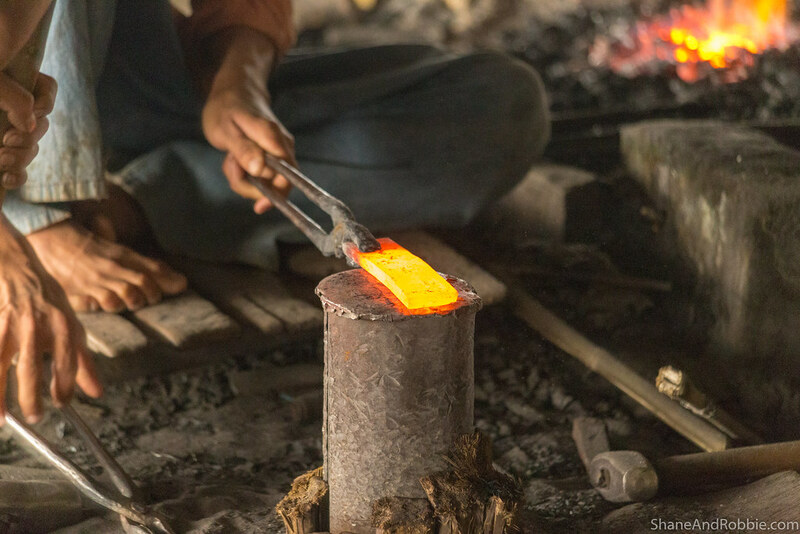 A ballet of rapid hammering stretched the molten metal into the desired thickness. Once the blade had cooled it was fitted with a wooden handle, and the smith hand-sharpened the blade with a primitive looking rasp. The resultant knife was honed to a wickedly sharp edge. It was hot, intense, and fascinating to watch! 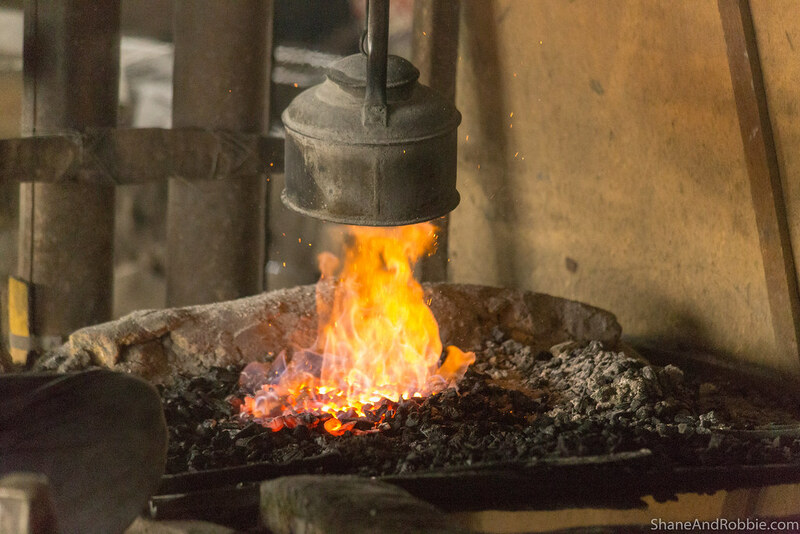 The silversmith workshop was equally hot, though the work of fashioning silver into jewellery was far more delicate, with the silver ingots being stretched to fine wires before being shaped around gems and fashioned into rings and necklaces. 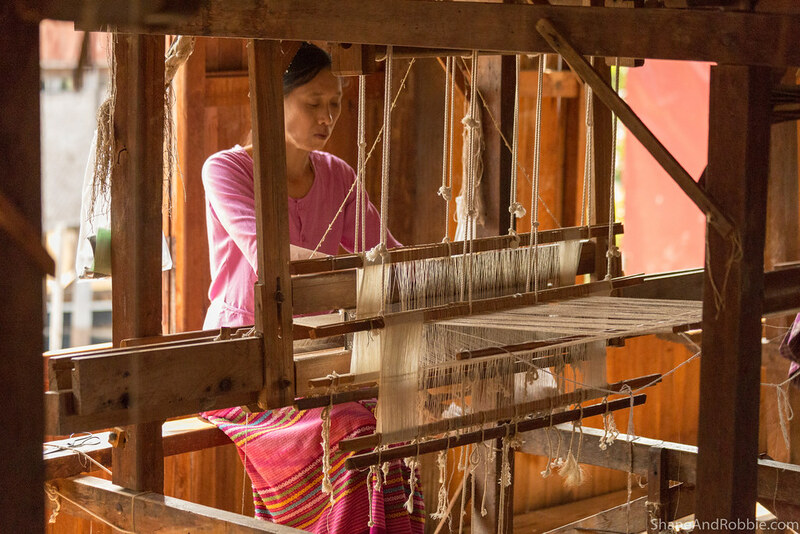 Inle Lake is the only place in Myanmar where fibres from the lotus plant are produced and woven; and today we were fortunate enough to see this done in Inn Paw Khon Village. 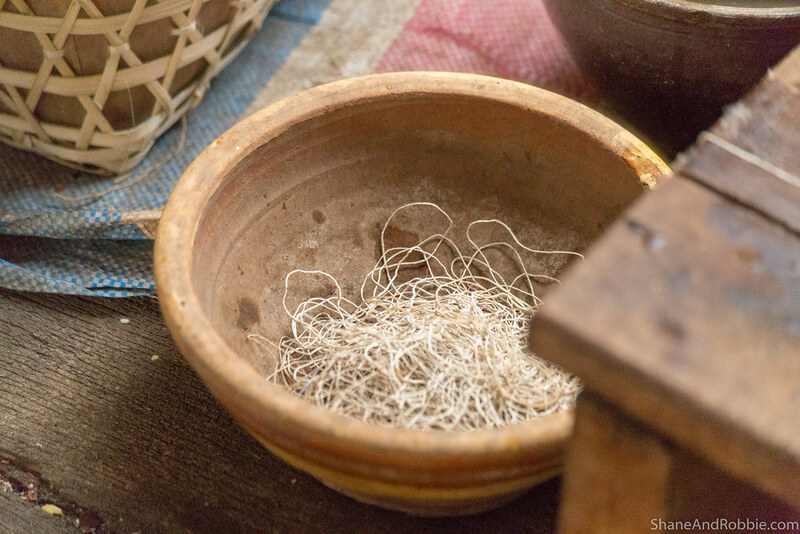 The entire process starts with stems from the sacred lotus plant being manually cut and stripped to produce gossamer-thin threads. 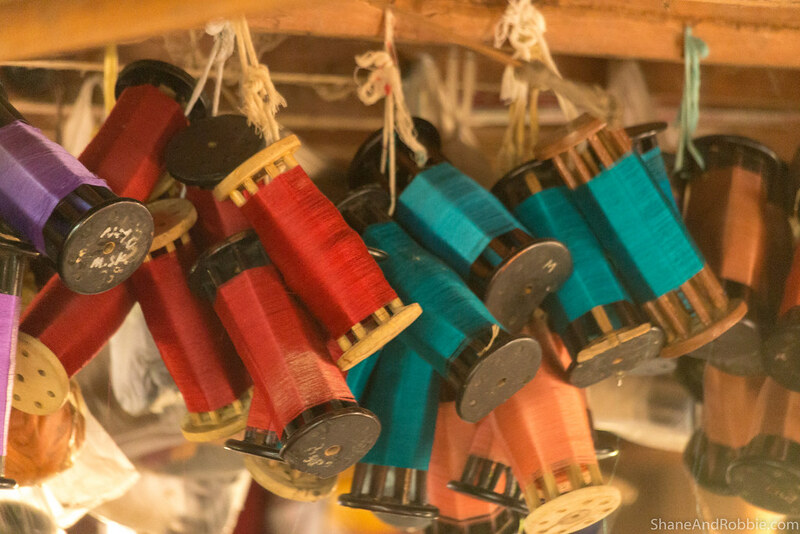 These threads are then spun using a foot-powered spindle, dyed, and woven using hand looms. 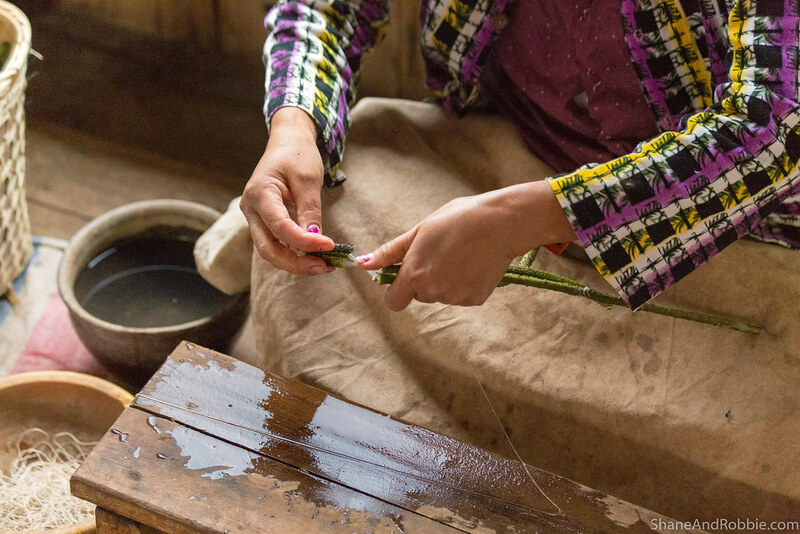 The entire process is very time-consuming and labour-intensive; we were told a small scarf can take over 4,000 lotus plants and a month to make, from stripping the fibres to the finished garment. 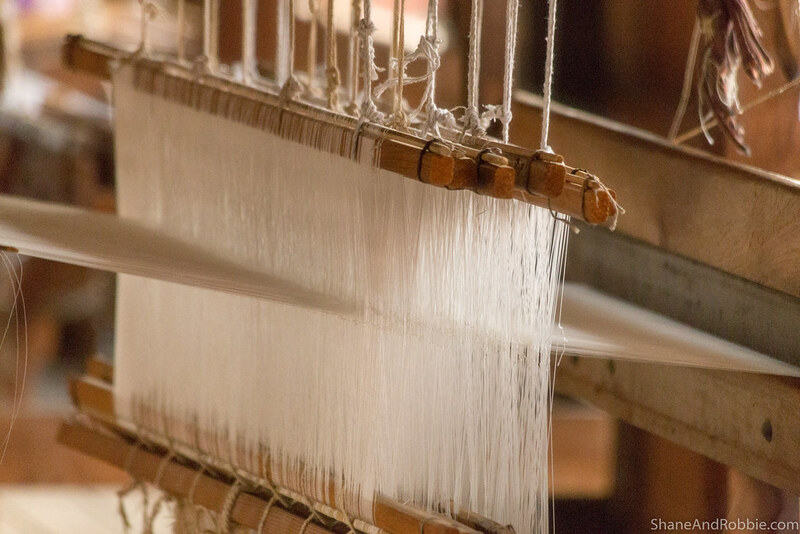 For this reason lotus-plant fibre is generally not used to make everyday clothes – they weave cotton for this. Lotus-plant fibre is reserved mainly for monks’ robes and cloth used in religious ceremonies. 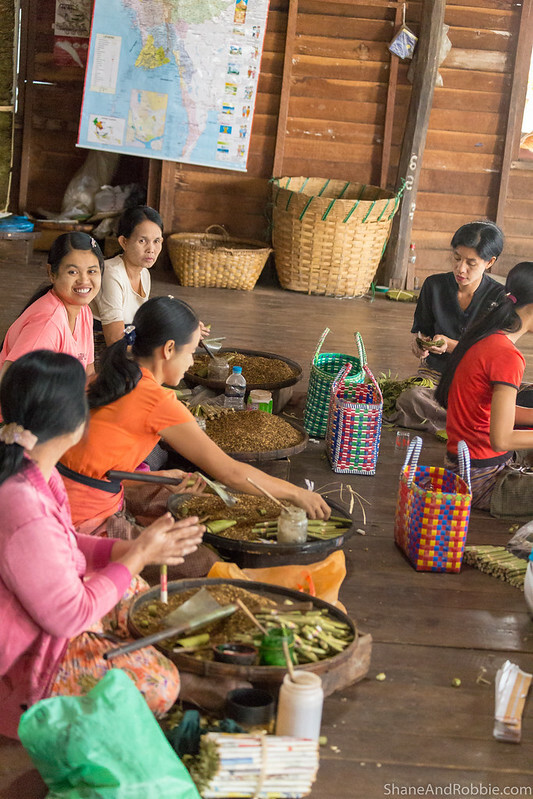 In Nam Pan Village, on the opposite side of the lake, we watched young women roll cheroots. These traditional Burmese cigars come in a variety of sizes and contain a mixture of tobacco, tamarind, honey, and spices (e.g. star anise, cloves). Alongside betel nut and alcohol, cheroots are the most type of recreational narcotic used here. Cheaper by far than factory-produced cigarettes or cigars, they also produce a far less offensive smoke and smell – more spicy than acrid like modern tobacco products. 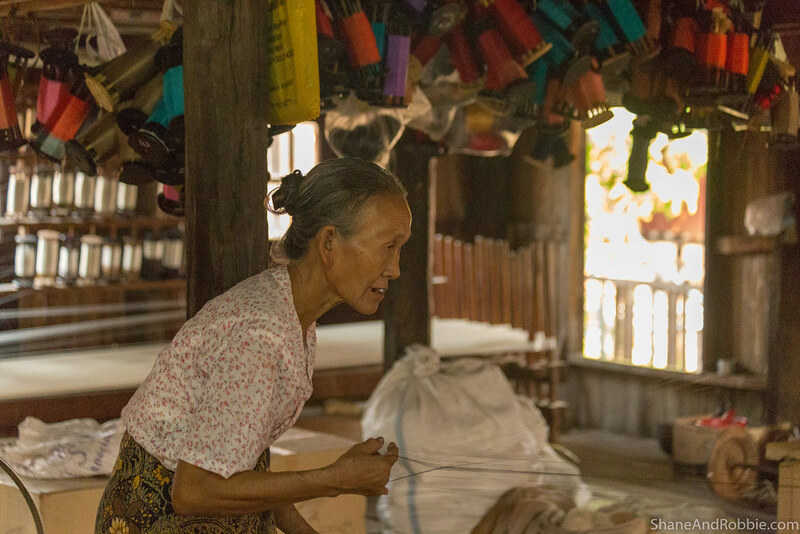 Last, but not least, we stopped in to see how traditional Burmese parasols are made. The process starts with the outer bark of the mulberry tree, which is collected and soaked in water and ash. The resultant “dough” is then beaten with a wooden mallet to form a fine-textured pulp. This is then spread across a bamboo frame covered with a very fine cotton fabric. 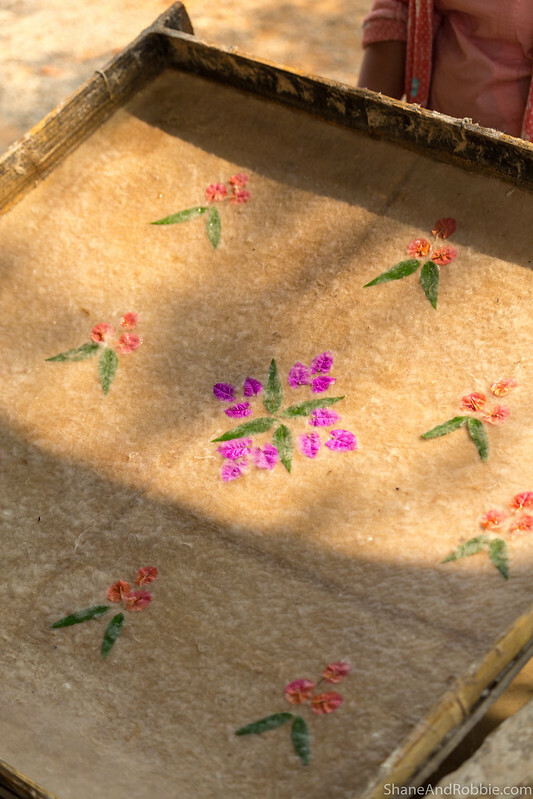 The frame and the pulp of paper is left to dry for a few hours in the sun to produce the paper that will then be used to make the canopy of the parasol. 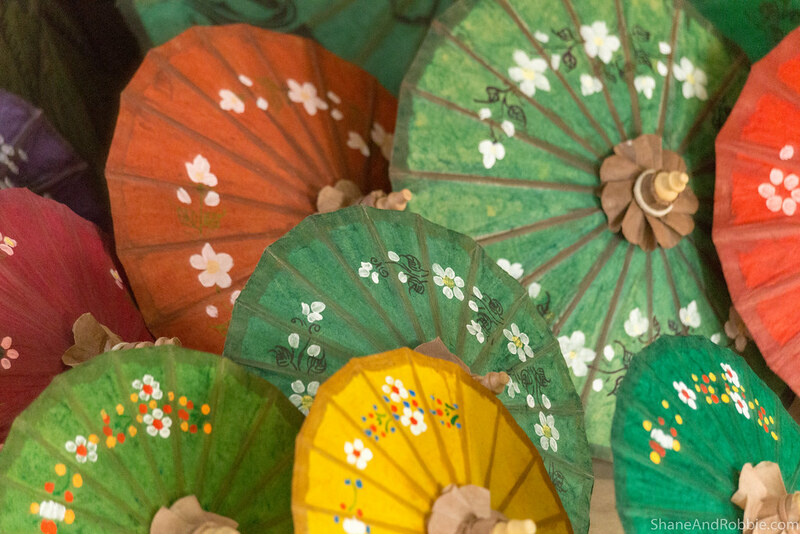 It’s not just the paper that is made from scratch – the entire parasol is completely made by hand, from the bamboo handle, to the umbrella frame, and even the pawl that allows the umbrellas to open and close. 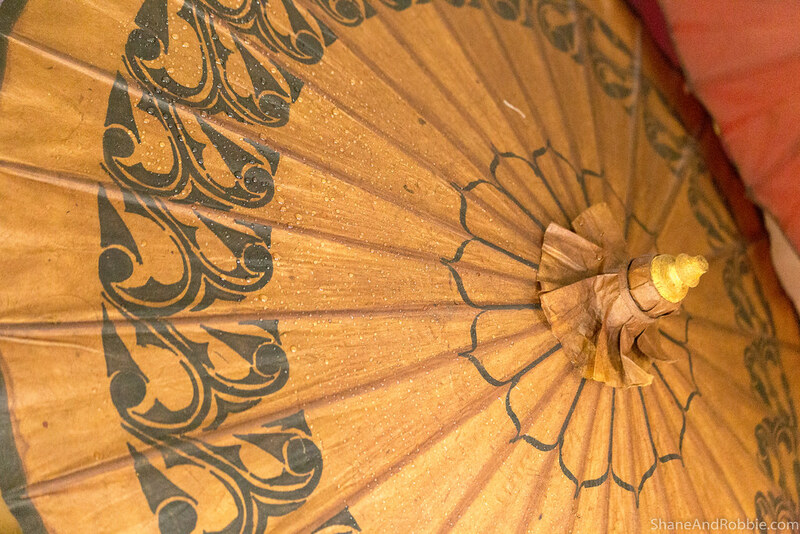 We watched as the shaft and ribs of the umbrella were made from bamboo, and local soft woods were used to create the rest of the umbrella. When all the different parts were ready, they were put together to create beautiful, colourful, and very practical parasols. 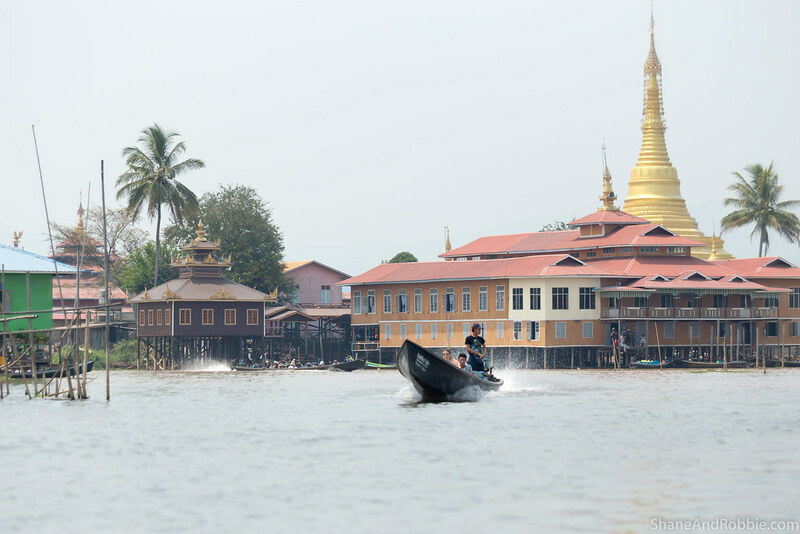 As in any community where religion is still an integral part of day-to-day life, the central temple on Inle Lake is a much loved and busy place of worship. Always keen to see slices of everyday life playing out, our last stop for the day was Phaung Daw Oo Pagoda. 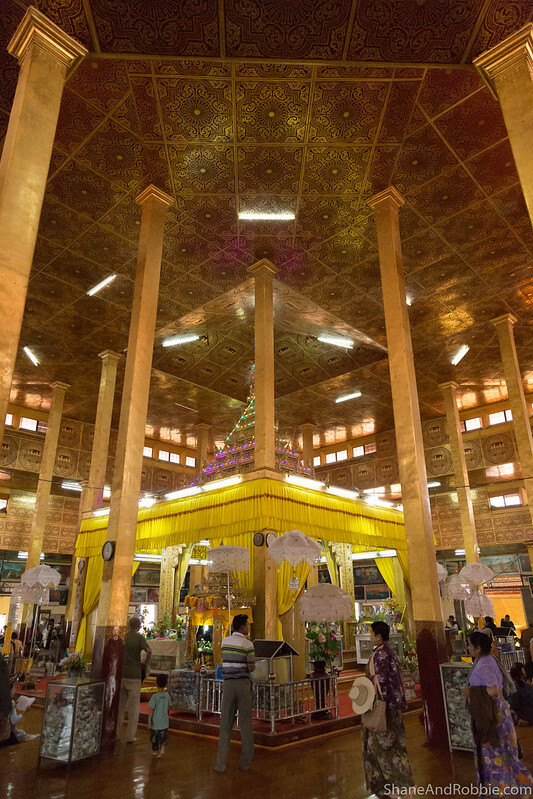 The temple houses 5 ancient images of the Buddha that were first enshrined here some 800 years ago. So much gold leaf has been applied to the images over the past centuries that they have become unrecognisable as Buddha images and look like solid masses of gold. By this stage it was late in the afternoon and we were keen to head back to Nyaung Shwe. 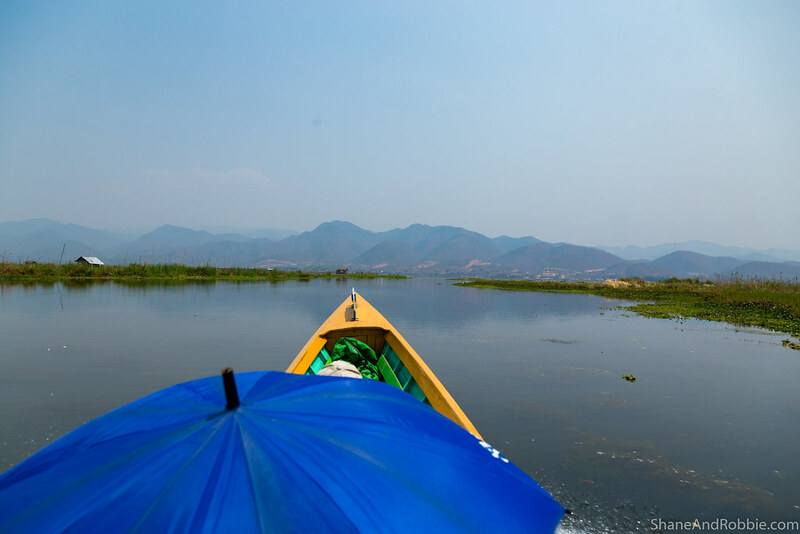 The trip home was uneventful but still fascinating as we retraced our route back up the length of Inle Lake, up the river, and back to our home-away-from-home. After a refreshing shower we found a local restaurant with a rooftop bar to sit at and enjoy the sunset. Another amazing day in Myanmar!